The pure emotions involved in traveling, the feeling of the open road beneath you, the limits that get pushed further every day. A new dimension. A world described by turns and straight stretches, scenery and hairpin bends, asphalt. Unique sensations. And just one name: Turismo Veloce. MV Agusta forsakes common ground and outlines a new way of understanding touring. Available in dealerships from the beginning of 2015. Lightweight. Feeling. Riding pleasure. Performance. The lightweight 800 three cylinder engine at the centre of the precious frame with steel trellis structure and aluminium plates. Electronics at the service of the rider. And so MV Agusta reinvents the Tourer bike, fast, lightweight and dynamic. The new 3 cylinder engine with 110 HP maximum power and torque increased by 15% (in the most commonly used rpm range) with respect to the engine that equips the Rivale and Brutale. The weight/power ratio and torque value make this bike unique and give it unforgettable riding pleasure. Specific pistons, compression ratio that optimises performance and consumption, top shelf electronics management. In fact, with the new MVICS 2.0 (Motor & Vehicle Integrated Control System), the injection time and required quantity of fuel at any time or engine speed are calculated with absolute precision. MVICS 2.0 uses the new TC and the EAS 2.0 with blipper system, all managed through the new 5” colour TFT instrument cluster which means that the Turismo Veloce is both docile when riding with the throttle barely open and vivacious with a twist of the wrist. Acceleration and pick up allow you to take on the competition, thanks in part to the ratios of the refined removable gearbox which have been optimised for this model. The already low fuel consumption of the three cylinder MV Agusta engines has been further lowered compared to current models, up to 20% less. And the search for optimum combustion in the chamber has made Euro4 approval possible. The availability of 4 engine maps (Touring and Rain with 90 HP maximum power, Sport with 110 and Custom which can be personalised) translates into maximum freedom of choice to match your riding style in any conditions. Some of the parameters that can be personalised are the engine torque curve along the power distribution arc (two levels), the rev limiter mode (more or less abrupt), throttle sensitivity (three levels), engine brake (two levels) and engine response (two levels). The substantial traction control evolution, adjustable to eight different levels or able to be disabled, gives the rider a system that guarantees safety first and foremost, but without penalising the feeling and sensations which are an essential part of the experience that comes with sitting in the saddle of every MV Agusta. The new operating logic of the quickshift gearbox falls under this same category: the EAS 2.0 lets the rider up and downshift without using the clutch. The result? Extremely reduced shifting times, comfort and a lot more focus dedicated on riding. MV Agusta Turismo Veloce 800. A name that dates back to the early days of Meccanica Verghera, the company founded on the intuition of Count Domenico Agusta and that is now at the very pinnacle of motorcycling thanks to 75 World Championship titles and an incredible history blended with both mystique and performance. 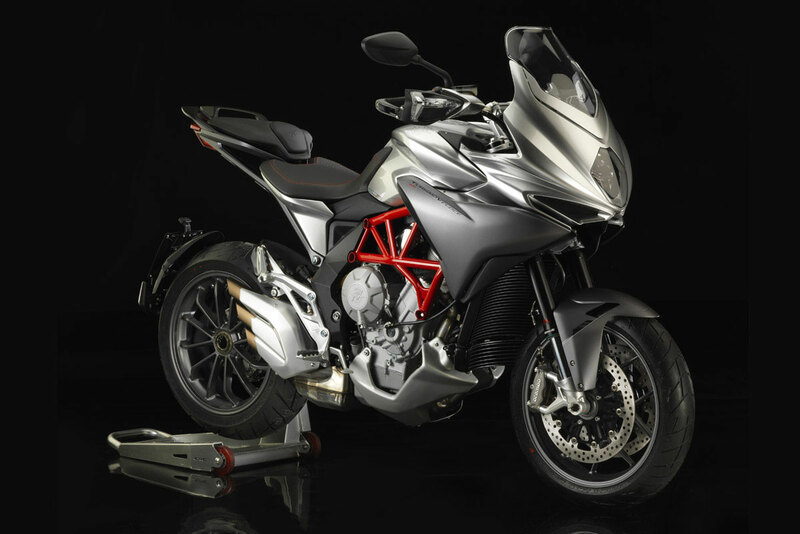 With the Turismo Veloce (literally Fast Tourer), MV Agusta has reinterpreted the tourer concept in the name of exclusivity, agility, ease of riding and performance. 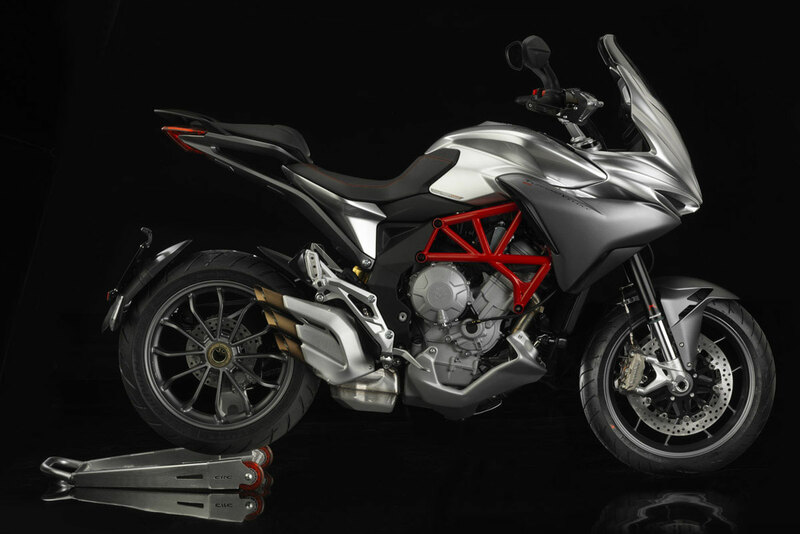 Unlike all of the heavier and oversized models offered by the competition, MV Agusta has chosen to utilize a compact and powerful 800cc engine. Turismo Veloce brings back the essence of Granturismo. It does so with its unmistakable lines and styling solutions which provide the practicality that no Grand Tourer can do without. It reiterates the same ideal with an approach to riding which makes the new MV Agusta the ground breaker for a new way of travelling. On the Turismo Veloce the complete integration of aesthetics and function is a reality and the unique design a lesson of innovation. 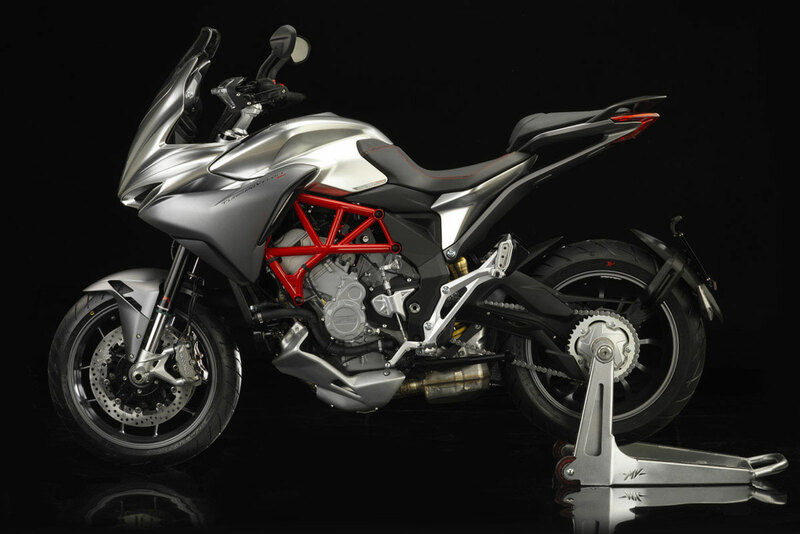 With the saddle bags removed, the Turismo Veloce becomes a true Sports bike as befits its MV Agusta name. With the saddle bags on, the Turismo Veloce remains slender, sleek and exclusive. The tail and headlight units use Full LED technology and add to the marked three dimensionality of the bike while emphasizing the new layout of the three exit exhaust pipes. The frame is unmistakeably MV Agusta – steel tubing at the front set off by aluminium alloy side plates – redesigned to meet the specific requirements of the Turismo Veloce. As a result, it is wider in the middle section and features special plates designed to act as an anchor for the centre stand. The Turismo Veloce makes good use of the rider and passenger saddle support and does likewise with the saddle bags thanks to a lightweight aluminium alloy support system. The suspension system has been developed to ensure maximum comfort when touring and dynamic performance in sports use. On the Turismo Veloce Lusso, the MVCSC 2.0 system, employing Sachs front forks and rear shock absorber, features a sophisticated electronic control system which, through continuous interventions to the hydraulic settings, provides the best possible response to all specific riding conditions. The ECU includes the inertial platform which supplies vital parameter readings which are key to the continuous suspension setting changes and employs the Skyhook algorithm. 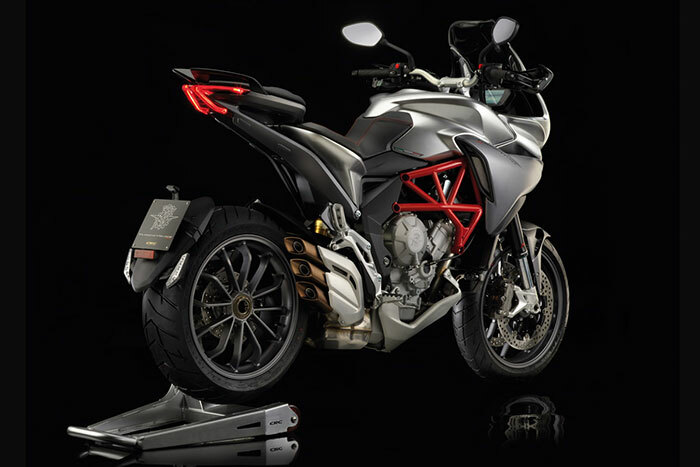 This algorithm has been specially developed by MV Agusta. The system acts on the hydraulic compression and rebound readings when the bike is in motion. The perfect blend of agility and performance. The Turismo Veloce is a perfect example of this: its three-cylinder 800cc engine is a new interpretation of the advanced engine on which MV Agusta has based the expansion of its model range. Its size would lead you to believe it’s a smaller engine thanks to the layout, and the three cylinders ensure excellent power output from low and medium revs then all the way up to the top of the rev range. This three-cylinder engine has many characteristics which make it a milestone for MV in terms of the technology applied to a standard production bike. The oil and water cooling systems have been integrated into the casting of the engine and this particular feature of the three-cylinder engine that gives it such an exceptional aesthetic impact and which allows it to blend in perfectly with the flowing lines of the Turismo Veloce. Under the cast and forged aluminium surfaces lies a counterrotating crankshaft derived directly from MotoGP. This was introduced as standard on the F3 675 and characterises the MV Agusta three-cylinder engine, not to mention the considerable impact it has on riding dynamics by significantly decreasing the effects of inertia when the bike changes direction. The precise application of fluid dynamic and thermodynamic principles, along with evolved electronic engine management systems have permitted specific fuel mapping settings to be designed to ideally suit both Tourismo and Sport riding modes on the new Turismo Veloce. (Electronically Assisted Shift) system is also present for the first time with clutch-less down-shifting and lets the rider select a higher or lower gear without having to use the clutch. The Turismo Veloce and Turismo Veloce Lusso will only be available with ABS. Access to the many parameters by which the rider can personalize the motorcycle is via new controls on the handlebars with an improved intuitive system that lets the rider make adjustments on the move without being distracted. Access to the menu is via dedicated buttons that make implementing changes to the management system parameters even quicker. The instrument panel on the Turismo Veloce displays the most important information and was designed specifically for this model. The panel features a 5″ TFT colour display which provides access to the numerous electronically controlled parameters. On the Lusso there is also an evolved GPS system to enhance its Touring character. The GPS displays route information, fuel consumption and engine use. Thanks to the TFT panel being perfectly positioned, the rider never loses sight of the road and can travel in the safest way possible. Bluetooth communication as standard on the Turismo Veloce puts the rider, passenger and bike in constant communication and allows the experience to be shared with others using dedicated apps. Control System) with three injectors.